For most of my life, garbanzos or chickpeas were a “canned” ingredient. They came in tins floating in starchy water, and you drained and rinsed them before using in callos, menudo, hummus, etc. In the past 10 years or so, with travel to Europe and the Middle East, I noticed dried chickpeas more and more, and these could be reconstituted in a long soak in water, and used as you might canned chickpeas. But it was only last year that I had ever come across fresh chickpeas, at a specialty New York City grocer that was selling them still in their pods. It was last Fall, and apparently fresh chickpeas from California or Mexico are in season in the fall. 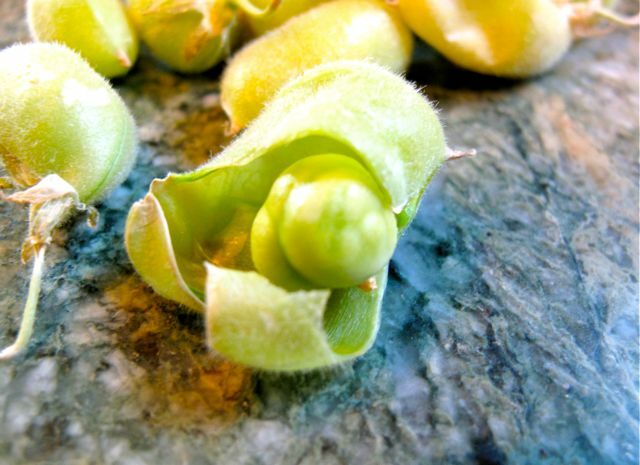 Similar to soybeans or edamame, these have a single or double chickpea in each pod, and you can eat them raw I suppose, they were mildly sweet and tasty, or blanched and enjoyed with some salt, or added to a variety of dishes that you might put beans into. They were a novelty for me, and beautiful to behold with their light green color that just made them look so fresh and appetizing. Had hummus for two consecutive breakfasts. I suppose these fresh peas also have that thin membrane that covers them? 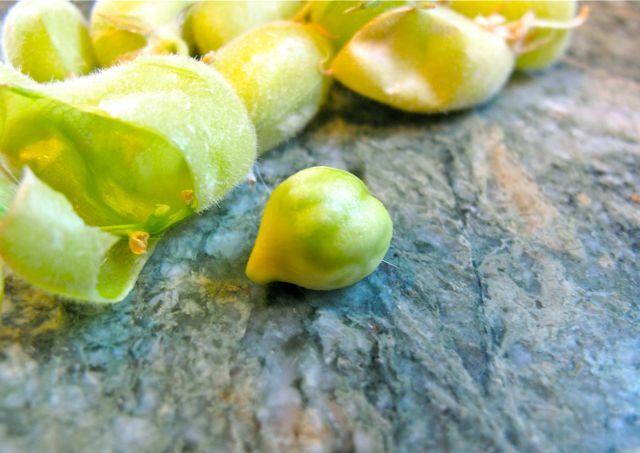 When using dried garbanzos, we soak them overnight, and then the next day laboriously peel off the the membranes coating each pea. It would be interesting to try cooking with these fresh peas. Maybe the membranes won’t have to be removed at all. 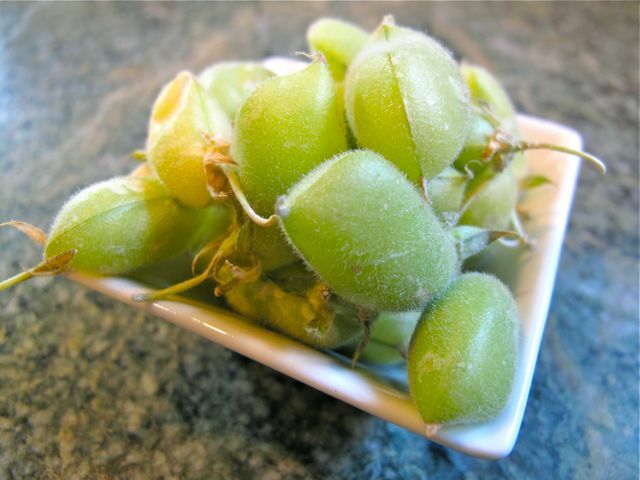 one of my favorite dessert – minatamis na garbanzos – very easy to prepare and cook. I always soak dried chickpeas in water with a big pinch of baking soda. The next day, tip out the water of the soaked chickpeas, add water to cover 2 inches over the tops of the chickpeas and simmer for 45 minutes to an hour. Do Not Add Salt. I never peel them. I use them as is, but I do remember my lolas having us apos peel them. I love hummus and falafels with tomato salsa and pita. Makes vegetarianism seem doable. Thanks, MM! First time I’ve seen fresh chickpeas. Where do our dried chickpeas in the Philippines come from? One of the few things our cook allowed me to do in the kitchen when I was kid was shelling the garbanzos that had been soaked in lots of water. By the way, chickpeas are very popular in Tuscany and Liguria. Recently had the pleasure of eating their tasty farinata/cecina, thin pancakes made out of chickpea flour. Papa Ethan: I’m sure there’s a scientific explanation, but “turo ni Lola” and I’ve just always done dried beans – white beans, garbanzos, black beans, kidney beans – this way. From what I remember the baking soda makes it “maligat.” Maligat means something like soft but still with bite, I think. Since I mash the garbanzos I don’t think the skins matter. I’ve also made Indian chickpea curry and the skins are not a problem. In Menudo I also do not peel, but I don’t see them float. my first time to see fresh chickpeas! great color, too. i wonder why i haven’t heard of them being used fresh, as in salads, or in soups. funny i never thought of them as having a “fresh” stage…to me they were always either dried or canned. thanks, MM! fresh chickpeas – a novelty for me. it’s usually the canned ones for us. i have a bag of the dried ones, it has been sitting somewhere in the pantry for a long time now. should do something with that. maybe with something curried. When we moved to North Carolina years ago, we stayed in the suburbs country side of the Jacksonville. The house we rented (built in 1800) is surrounded by huge plantations/cattle & hog farms. The neighbor in front of use had soy beans and chickpeas garden which she cans. One time she gave me a bucket full of fresh “garbanson” and I did not know what to do with it. After little lesson on how to extract the seed from the plant, I just went ahead and steam fry pan it with little butter. They taste so different with the canned ones. Until now, I still don’t know how I might have cooked it in a different way. Ebba…if your neighbour gives you buckets of fresh garbanzo beans again, …make them into a healthy high protein snack like garlic peanuts! …not so healthy after you have eaten the entire bucket! After making it soft, drain and pat dry, roast them in the oven drizzled with oil. Instead of olive oil, drizzle or coat them with garlic infused canola oil (from the fried garlic) and roast them until crisp. Once you take it out of the oven, salt them. Remember, it will become crisp as they cool down. Then pan fry garlic slowly until light golden brown. Then add them to the crispy garbanzo beans…..makes excellent hostess presents in a nice jar. There are a lot of flavoured toppings or salt you make make. Since you are in Texas, make a chili flavoured salt, or curry flavoured salt. I am Ms. 5 -spice as you know by now, so in our household, 5-spiced salt is in our cupboard all the time! The 5-spiced salted garbanzo beans …the taste is akin to the spiced dry peanuts na ang hirap tigilan kainin we buy packaged at Chinese grocery stores. I’m a new reader of your blog and I have been a daily reader every since. I once spent over five hours reading your old blogs. Thank you so much for this blog. I’m one of your new fans as well. I’m hoping to try the recipes you have posted here. I’m currently working on losing some weight. So for now, I will just “feed” my mind with all these delicious food here. i always see fresh garbanzo beans in the mexican market i frequent to but i have never tried cooking them, will buy some next time and try bettyq’s recipe, i only buy roasted peanuts, cashews, almonds when it goes on sale hehee, my husband eats them like there’s no tomorrow. Ms. Bettyq, thanks ulit sa forever mong “walang katapusan” na ideas. Ayy naku lang, dito sa Houston, hindi pa ako nakaka-kita ng fresh ones. Baka sa Whole Foods, or katulad ng sabi ni alilay – try ko sa open Mexican Market dito. Yey, hind na ako bibili ng super alat na Boy Bawang. MM, sorry for my typho – I did not check my entry before my submittal. Alilay and Ebba….huwag na ninyo pahirapan ang sarili niyo sa paghahanap ng fresh na garbanzos sa init ng panahon ngayon! Canned ones will do. If you have to buy fresh, you need to cook them or boil them till tender anyway before roasting them! Canned ones…open the can…..
On the net, there are variations but I prefer our garlic taste much like our garlic peanuts and the Chinese spiced peanuts using the 5 spiced salt available also at Chinese grocery stores….or you can make your own! Are there crispy garbanzo beans sold back home? Yey ulit Ms. BettyQ, sige bili agad ako bukas… 3 cans na para kung magkamali ako.. ulitin ko ulit. Try ko nga pala yung garlic chili oil. Excited na ako…Thanks. We buy a kilo of dried garbanzos and make enough hummus to float a boat; it goes quickly into our gullets, the garlickier the better. The gresh ones remind me of wasabi flavored green peas. Are these available in Manila? Where can you buy dried chickpeas in Manila? Reef Fresh Seafood at the Bantayan Town Market! !